"This is a very well thought out idea. Everything is just perfect, right down to the knick-knacks. Thank you for a perfect anniversary!" "A surprise package waiting to be opened"
Privacy leads to serenity. And you'll find it in abundance here. We'll never impose. 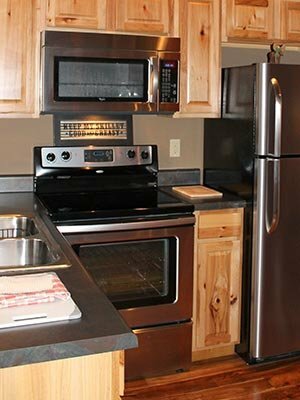 In fact, our accommodations are designed to be self-sufficient, from a variety of kitchens, to stacked washer-dryers in some of the cabins. If you choose, you may check in and count on never being disturbed until you leave. And, your stay is even more special with little touches like fresh coffee beans and microwave popcorn. You'll delight in our focus on smoke-free privacy. A smoking area is provided with each cottage style room and cabin on the back deck overlooking the Eureka Springs woods. Appointments abound inside our designer-quality cabins and cottage-style rooms. Each follows a particular theme that is reflected again and again everywhere you look. This is but a part of the thought that went into designing Eureka Sunset Lodge and Cabins. We are ready for your stay and your return when you make Eureka Springs a stop along the way. Enjoy the unique array of shops in downtown Eureka Springs, the gourmet cooking and local flavor at local restaurants and take in some of the attractions unique to the Eureka Springs landscape. Nourish your soul and make memories that last a lifetime in our rustic, but elegant setting, built in such a way that you are among the treetops. Rustic elegance. The two are fused at Eureka Sunset Lodge and Cabins. Our cabins become one with the deep woods with their rustic exterior, but once you enter the front door you become caught up in the well-appointed elegance of the interior. A quick glance at our photographs will make this quite evident to you. Each Cabin and Cottage-Style Room offer unique amenities. Please refer to the individual Cabin or Room pages for detailed descriptions of their amenities.